The creepage distance for insulators is the shortest distance along the insulator surface between the metal parts at each end of the insulator. Creepage distance can also be refer as leakage distance for insulators. If the surface of the insulator is clean, smooth and well gazed the dust particles tend to fall down. When an a.c voltage is applied to the apparatus, the dust particles have a tendency to align to the direction of electrical field lines on the surface of the insulator. If the surface of the insulator is rough and moist this alignment will be faster. The continuous application of voltage causes slow alignment of these particles. To prevent a continuous conducting track, the insulator should have sufficient ceepage distance or leakage distance. During power frequency withstand test of an unclean insulator, the flash-over occurs along the dirty surface of the insulator. In case of internal gas filled or oil filled apparatus, the internal surface should also be free from moisture and dust. Otherwise internal flash over can occur along the surface by tracking. 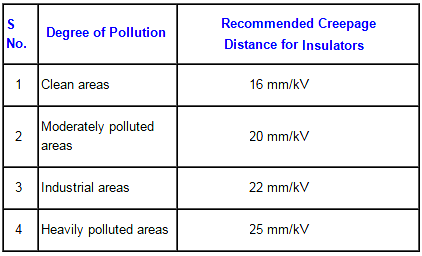 Some of the typical creepage distance for insulators in substation provided based on the level of pollution are tabulated.